Balance bikes for kids are a great way for children to learn how to balance on a bike before they ever attempt to ride a big kid bike. A balance bike offers your child the opportunity to learn how to balance and steer without adding peddling to the mix. Balance bikes are VERY popular in terms of helping children master the skills they need in order to ride a two-wheeled bike when they get older. It allows them to coordinate between balancing and steering as they begin to master these two skills. Once your child learns how to steer and gains confidence and control of their bike, he or she will be able to lift up their feet and cruise along while balancing on their bike. The seats on these bikes are adjustable to accommodate your child’s height and comfort level. Once your child has accomplished those two skills they will be ready to transition to a pedal bike with confidence. This type of bike also eliminates the need for training wheels as your child will have mastered the art of balancing on a balance bike. The nice thing about these types of bikes is they are designed to grow with your child. The frames on these bikes are lightweight allowing a child to ride and stride with great ease. If your toddler is eager to learn how to ride a bike and wants to get out there, then a balance bike will offer him or her the opportunity to learn how to balance and steer while having FUN and gaining confidence. On this page, we have reviewed some of the more popular and sought after brands that both parents and kids LOVE. Read the reviews, to help you decide which balance bike would be right for your child. The Critical Cycles Cub Balance Bike – 12″ in Lavender will help your child develop confidence in riding with its a low down tube frame which makes it easy for toddlers to get on and off this bike with ease. This bike is adjustable so as your child grows, you can adjust the position of the handle bars and seat tube to fit your child. The Cub Balance bike is also virtually maintenance free as it has no pedals or chain. The frame of this balance bike is made of steel and the tires are air-free which means they won’t deflate. This Mint Balance Scooter Bike by Janod is a stylish, durable wooden bike that is modeled after a retro motor scooter. The seat on this bike is adjustable so tots big and small can remain comfortable as they grow with this bike. The tires are inflatable and this balance bike is recommended for children ages 3 to 5. This bike measures 30 1/4″ x 13 1/4″ x 20″. With this bike, your child will get a head start in learning how to ride a bike without the need for training wheels. This balance scooter bike is very sturdy and will help your child learn balance and coordination in preparation to ride a bigger bike some day. 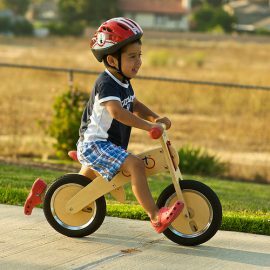 The Toddler Janod ‘Bikloon’ Balance Bike is a sturdy wooden bike designed to help little ones maintain balance without the need for training wheels. A comfy, padded seat adjusts to the perfect height to ensure your child stays comfortable as they confidently ride down the street. This balance bike is red and white and measures 32″ x 15″ x 21″. The tires are inflatable and this bike is recommended for children ages 3 to 6 years old. The Toddler Strider ’12 Sport’ Balance bike is a lightweight, no-pedal bike that grows with your child. The no-tool seat and handlebar heights adjust to accommodate ages 18 months to 60 lbs. 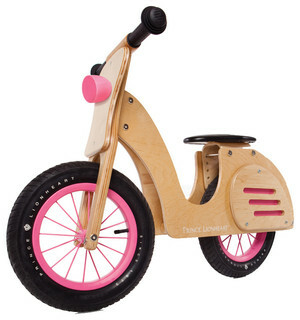 This balance bike features a padded saddle with padded mini-grip handlebars. This bike is EASY to assemble and has flat-free EVA polymer tires with a frame-integrated footrest. The built-in foot-rests on this balance bike are perfect for learning to balance and glide. Lots of colors to choose from for both boys and girls. Prince Lionheart’s award winning Whirl balanceSCOOTER in Pink will teach your child balance and coordination which are crucial skills that are necessary before transitioning to a two-wheeled pedal bicycle. Your child’s sense of independence and self-confidence will develop and become apparent as they learn to balance and steer at their own pace. First by walking with their balance bike and then graduating to gliding while having FUN. This balance scooter is a great transition from ride on toys to a balance bike. The frame of this bike is made from birch and the seat is adjustable. The handgrips are made of solid rubber as well as the 12″ tires. This balance scooter will help your child master balance, steering and coordination in preparation to ride a two-wheeled pedal bike in the future. The Schwinn Skip 4 Kids’ Balance Bike features a light premium diamond steel frame that is low enough for a child’s foot to rest on the ground. 12″ air-filled tires and spoked wheels come with colored rims. An alloy handlebar and stem keeps your little one in control, and a tool-free adjustable seat post lets them grow with the bike. The Skip 4 comes with a limited lifetime warranty for as long as you own it! Enjoy the freedom of riding a Schwinn. This Manufacturer’s suggested age for this bike is 2.5 to 5 years old. This bike is available in two different colors: Green & Black or Purple. I have also included a video with step-by-step guidelines for teaching your toddler how to cycle on a balance bike from Cycling UK (formerly CTC), the national cycling charity in the UK.